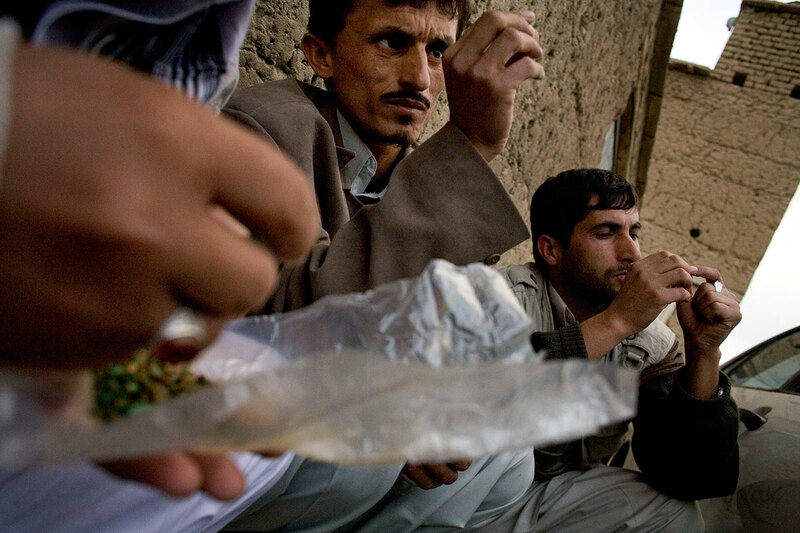 October 26, 2007- Khenj, Afghanistan: Emerald buyers from Kabul, Hiatullah, left, and Gulalam, right, look at a pocket full of emeralds brought down the mountain in the village of Khenj, Afghanistan on Friday, October 26, 2007. Most miners keep their emeralds in a plastic package. Usually the partners in a mine will weigh, count, then wrap the emeralds they find, signing the wrapping to insure they all agree on what was found. Then the package is opened again when it reaches the village and is sold.